Rain, snow, ice, sun, wind and mold are no match for this rugged fabric protector - with its snug, adjustable fit, it will keep your outdoor loveseat safe, clean and dry all year round. Double your peace of mind with two levels of protection: an outer surface that sheds precipitation and won't crack in cold temperatures, plus a PVC undercoating that stops water in its tracks. This heavy-duty material is sewn with strong, interlocking seams to withstand years of wear and tear. No matter how the wind blows, you can be sure this cover won't be going anywhere. Built into the hem is an elasticized cord with toggle stop that you tighten under the bottom edges of the seat. Then for good measure, straps at each corner wrap around the loveseat's legs and secure in place with a one-click buckle. Your loveseat is completely protected, not just from above but also from any water that might splash up from the ground. Mesh air vents prevent condensation from building up under the cover, so mold and mildew never get a chance to grow. The vents also help reduce ballooning caused by wind gusts. But while they allow the air to circulate, their overlapping edges keep everything else out. Sturdy, padded handles let you simply slide the cover into place, then pull it off whenever you want to enjoy your outdoor living space again. 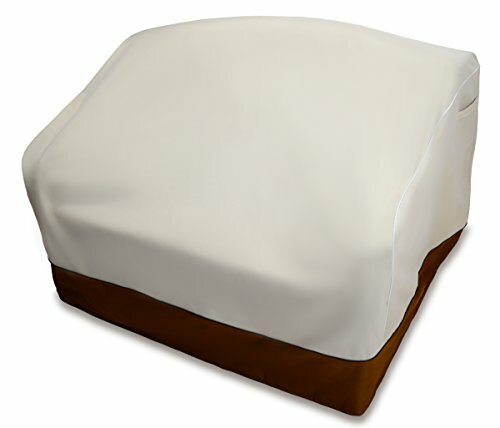 The sturdy, reliable service of this loveseat cover is backed by a full 3 year warranty against damage by dry rot, sun exposure, mold or mildew. Your loveseat will come out from under cover looking as good as it did when it went in!